Title: Can the Higgs Be Supersymmetric and Composite? This is the second article in a series on the MINERνA neutrino experiment. Recycling is a key part of the prototyping for MINERvA, the point-blank, high-intensity neutrino experiment that will operate in the NuMI Near Hall. For example, the "veto wall," which identifies neutrino events by determining whether they came from the front of the detector, comes from the old NuTeV experiment. "We're borrowing a lot of technology from a lot of different places," says project manager Debbie Harris of PPD's Neutrino Department. There are many resources open to borrowing at Fermilab, with significant overlap from university contributions. The veto wall is being refurbished at the University of Rochester, and then will be returned to Fermilab for MINERvA. The huge steel rails used to hold components of the MINOS near detector while they were being constructed at New Muon Lab will be used to hold the frames of the MINERvA detectors. The photomultiplier tubes are the same design as those used in MINOS, so all that's required is purchasing more of them. The "trip chips," which digitize the signals coming from the photomultiplier tubes, will be the same as those used at DZero. At the heart of MINERvA are the scintillator bars, the "active medium" forming the primary target for the scattering of neutrinos. The triangle-shaped scintillator bars are being made at the 70-foot extruder for scintillating plastic at Lab 5, operated jointly by Fermilab and the Northern Illinois Center for Accelerator and Detector Development. Jim Kilmer of PPD's Mechanical Department is determining the best kinds of steel for "partly instrumented" components holding scintillator inside, and for a leakproof exterior. Bob Bradford of the University of Rochester is figuring out how to bring steel and scintillator components together. "All the work is connected and sometimes it's hard to make distinctions," says Harris. "There is very extensive university participation in MINERvA." Its assembly of advanced apparatus, at the University's Semiconductor Detector Centre, has been a joint effort by physicists, engineers and technicians from the Universities of Liverpool, Glasgow, Lancaster, Manchester and Sheffield as well as Daresbury and Rutherford Laboratories. The endcap is part of a semiconductor tracker (SCT) based at the heart of ATLAS - a giant particle detector the size of a five-storey building. The SCT will become part of the world's largest particle accelerator � the Large Hadron Collider (LHC), based at CERN, the European Centre for Particle Physics Research, in Switzerland. The LHC is being constructed 100 metres underground in a 16-mile long circular tunnel, running under the Franco-Swiss border. Inside the tunnel two particle beams will be accelerated to extremely high energies, and will crash into each other forty million times a second, creating a snapshot of conditions that existed billionths of a second after the 'Big Bang'. ATLAS, the culmination of 15 years' work by over 150 European institutions, aims to find the Higgs particle that holds the key to understanding the origin of mass. 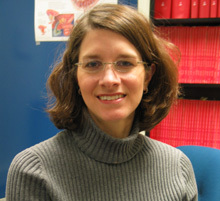 In December 2005, Dr. Katherine Baker joined the Northern Illinois University Institute for Neutron Therapy at Fermilab (NIUINT at Fermilab) as the new medical director. Dr. Baker is assisted and advised by Dr. Kurubarahalli Saroja, also a recent hire. Both are members of the Nuclear Oncology Service Corporation. A Wisconsin native, Dr. Baker attended medical school at the University of Wisconsin-Madison and completed a residency at Rush University Medical Center in Chicago. Neutron therapy, she says, "was something I had always learned about in my residency. When I was doing my training, Dr Saroja would come over and give us lectures about it. It was something all the residents in my program were exposed to." 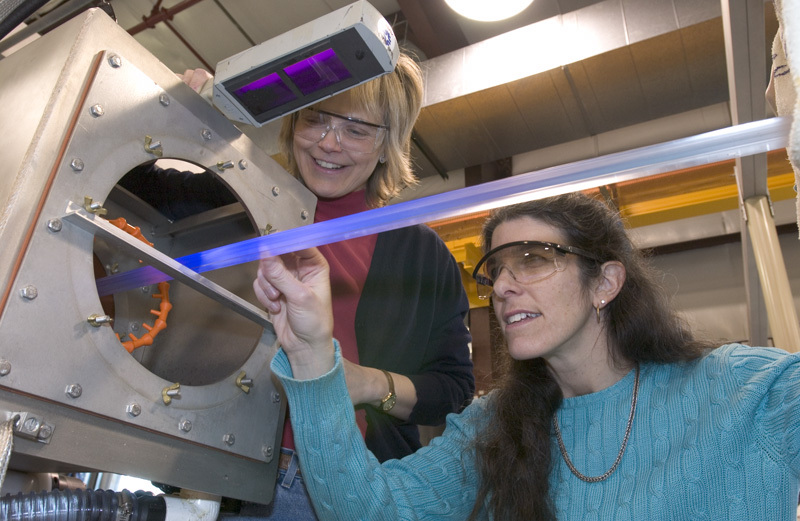 Her appointment at NIUINT at Fermilab is her first directorship since becoming a nuclear oncologist. "Right now the most standard area for neutron therapy is with salivary gland tumors and sarcomas; we can really see big benefits there," she says. "A potential area that's not as well developed would be to look at neutron therapy in glioblastomas." NIUINT at Fermilab currently treats salivary gland tumors, advanced prostate cancer, head and neck cancers, melanoma, and sarcomas, while the effectiveness of neutron therapy for glioblastomas (brain tumors) may be a possible focus of future research. When she's not busy with work, much of Dr. Baker's free time involves her husband and her three children, ages 7, 5, and 11 months. She also likes to cook, especially Italian, and "to exercise when I get a chance, biking, hiking, and swimming," she says. Nominations for the 2006 award must be submitted to Steve Wolbers by March 1, 2006, and should include a letter supporting the merits of the thesis being nominated. To qualify, the thesis must have been submitted as partial fulfillment of the Ph.D. requirements during 2005; it must be written in English, and submitted in electronic form to the Fermilab Publications Office in accordance with Fermilab policy. There will be a PC manager meeting from 9-10 am today in WH8X0. The agenda includes Windows policy, licensing (Microsoft training points), security (Microsoft patch Tuesday update), email (anti-spam update) and cool tool of the month (open to suggestions). International Folk Dancing will meet Thursday, February 23, at Kuhn Barn on the Fermilab site. Dancing begins at 7:30 p.m. with teaching and children's dances earlier in the evening and request dancing later on. Newcomers are welcome and you do not need to come with a partner. Info at 630-584-0825 or 630-840-8194 or folkdance@fnal.gov. The next meeting of English country dancing will be this coming Sunday, February 26, at 2 p.m. in the Kuhn Barn. All dances are taught and walked through, and you do not need to come with a partner. Info at 630-584-0825 or 630-840-8194 or folkdance@fnal.gov.